Here are the newest technical articles, videos and pictures of Roller Burnishing Tools, we focus on mirror surface finishing and technology sharing. Skive and Roller Burnishing Tool is also called boring and rolling tool, scraping and rolling tool, oil cylinder scraping and rolling tool, etc. With advanced boring and rolling combined processing technology in Europe, the boring and rolling function can be completed once and again. The processing accuracy can reach IT8 level and the surface roughness can reach Ra005-0.2 micron. Skiving and Roller burnishing Tool is mainly used for finishing the inner hole of hydraulic cylinder. Compared with the traditional honing machine, the equipment has the advantages of low noise and pollution-free, and can greatly save labor costs and high processing efficiency. Hydraulic Cylinder Finishing Tool can save 80-90% of the processing time than the old boring rolling or boring honing. To improve the surface roughness, the roughness can basically reach about Ra ≤0.08 M.
Correct roundness, the ellipticity can be less than 0.01 mm. Increasing surface hardness, eliminating stress and deformation, and increasing hardness HV≥4°. There is residual stress layer after processing, and the fatigue strength is increased by 30%. Improve the quality, reduce wear and tear, prolong the service life of parts, but reduce the processing cost of parts. One – time shaping trimming chamfering tool is a new type of cutting tool used in machinery manufacturing industry. It has scientific and reasonable design and superior performance. It can solve the problem of chamfering inside the hole. 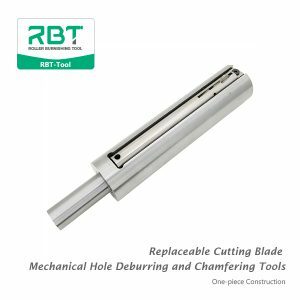 The double cutting edges chamfering & deburring tools can be widely used in the double-sided chamfering and deburring of various holes in the machinery manufacturing industry. It is the current market chamfering tools can not be replaced by chamfering tools. 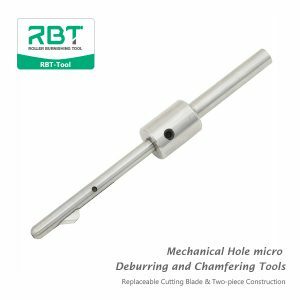 The inner hole chamfering & deburring tool has so many advantages, so how about its cost performance? 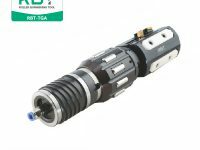 Its price is not high, superior performance, long service life, especially the replaceable cutting blade mechanical hole deburring and chamfering tool. 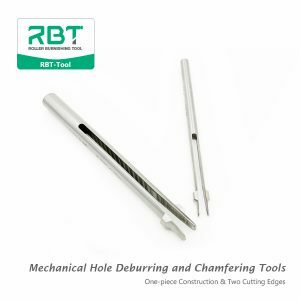 How long is the service life of the inner hole chamfering & deburring tool? This problem can not be solved concretely, because there are too many factors. 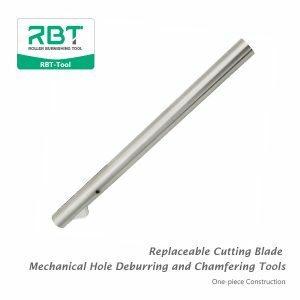 Using RBT inner hole chamfering & deburring tool, the conventional steel parts can be machined with 8-10 holes, which can process about 7000-8000 holes. In addition, the replaceable cutting blade deburring and chamfering cutters and blades can be grinded repeatedly, and blades equipped with blades can be grinded or replaced. So the service life of inner hole chamfering & deburring cutter is determined by the material and frequency of your work. In the process of inner hole rolling, the rolling elements (wheel roller, ball roller or pin roller) in the rolling device screw along the circumference of the surface of the processed hole wall, and exert a certain radial pressure on the processed hole wall. Under the rolling pressure of the rolling element, the inner hole of the workpiece produces elastic deformation (△Py) and plastic deformation (△P0). Plastic deformation not only changes the shape of the machined surface, but also changes its structure and physical properties. The irregularity peaks and valleys of the workpiece surface are ironed and filled, which reduces the surface roughness and improves the processing accuracy of the workpiece. The lattice of the rolled layer metal produces shear slip, severe distortion, elongation, fibrosis and breakage, which makes the structure become compact, the grains become finer, and the grain shape extends along the direction of maximum deformation. At the same time, compressive stress is produced in the metal surface, which strengthens the metal surface and improves the strength and hardness of the surface. This picture shows the deformation of the inner hole of the ball (column) rolling mill. The surface roughness of the inner hole is obviously reduced due to the plastic deformation of the surface metal of the hole wall caused by the rolling pressure of the rolling element. This picture shows the axial rolling trace of steel ball on the hole wall when rolling the inner hole with ball roller burnishing tool. The average height of roughness Rz is: within the basic length, from any line parallel to the midline of the contour, to the average distance between the five highest points (peaks) and the five lowest points (valleys) of the measured contour. Fig. 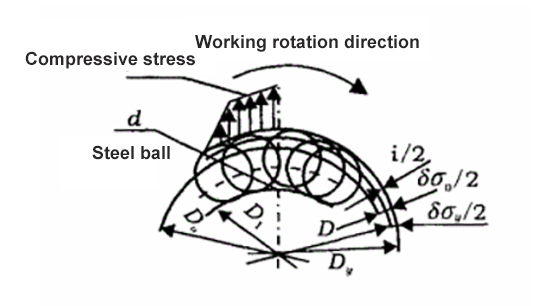 F1 shows the center distance of the axially rolled tracks of two adjacent steel balls on the hole wall. If the roller burnishing tool distributes m steel balls on the circumference and the axial feed is f, then F1 = f/m. The average height reduction of roughness after rolling is Rz1. 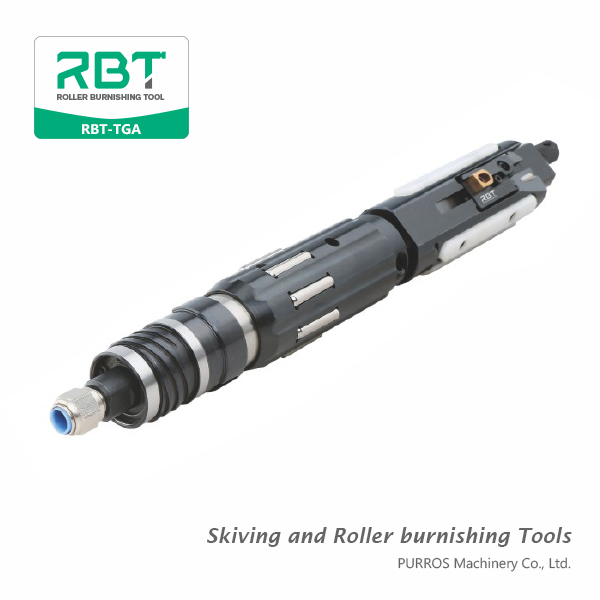 Surface roughness of rolling parts is related to the intrinsic parameters of roller burnishing tools (diameter and number of balls) and the feed during rolling. Therefore, choosing ID roller burnishing tools with smaller diameter and larger number of steel balls and adopting smaller feed can make the surface roughness smaller after rolling. In actual production, for the processing of RaO.04μm~Ra1.6μm inner hole with surface roughness, the common processing technologies are grinding, rolling, broaching and honing. Broaching tools are expensive, efficient and suitable for mass production. The roughness of honing surface for finishing requires Ra0.04 um or more. So grinding and rolling are commonly used. Next, through the analysis of the processing technology of a part, the grinding and rolling processes are compared. The parts are shown as follows: the inner diameter isφ140±063, the roughness is Ra0.08μm, and the roundness tolerance is 0.045 mm. The original processing technology: turning–Rough grinding–finish grinding. Turning residual grinding is 0.2mm~0.4mm. This process can ensure the technical requirements of the processed parts. Field test results show that the surface roughness Ra is 0.08 μm, the dimension is within the tolerance range of φ140~φ140±063 mm, and the roundness tolerance is within the range of 0~0.025 mm. Grinding is a high-speed cutting, which can be dispersed, reduce the surface roughness of parts, and improve the dimensional accuracy and geometric accuracy of parts. But he still has many shortcomings: 1. In the grinding process, because of the rapid grinding speed, a large amount of grinding heat will be transferred to the parts, which makes the parts temperature rise tens of degrees, the parts shrink after cooling (affected by ambient temperature), and the aperture shrink. In order to ensure the dimensional accuracy, the workpiece size after completion needs to be adjusted artificially, so there will be the phenomenon of inaccurate processing size. 2. The high temperature in the grinding zone (the local surface temperature can reach 1000 C) causes great harm to the service performance of the parts. The surface layer will have residual tensile stress, grinding cracks, burns and so on. 3. In actual production, it is difficult to reduce the heat generated by grinding and the grinding efficiency is low. Current processing technology: roughing–half finishing turning –finish turning– roller burnishing. Parts can be processed on the lathe, and this process can also fully guarantee the technical requirements of parts. Field results show that the surface roughness is Ra0.08 μm, the dimension is between φ140.02 mm – φ140.04 mm, the processing dimension is relatively concentrated, and the roundness tolerance is between 0.01 and 0.03. In order to ensure the quality of the parts, the process requires a high turning requirement. The surface roughness of the finished parts is Ra3.2μm and the dimension is φ140-0.01 0.02. Because the actual pressing volume of the parts processed by rolling is very small and the parts are processed by positioning themselves on the surface of the parts processed, the surface roughness of the parts can be reduced and the dimensional accuracy can be improved. However, the shape deviation of parts will not be significantly improved, so the accuracy of parts after rolling mainly depends on the accuracy of pre-processing (turning) and surface roughness before rolling. Rolling processing is chip-free processing, no heating phenomenon, and the finished size, i.e. the forming size, is easy to control. Residual compressive stress and cold hardening are produced on the surface of parts by rolling, which can improve the fatigue strength of parts, and its production efficiency is high. The disadvantage of this method is the need to customize roller burnishing tools. 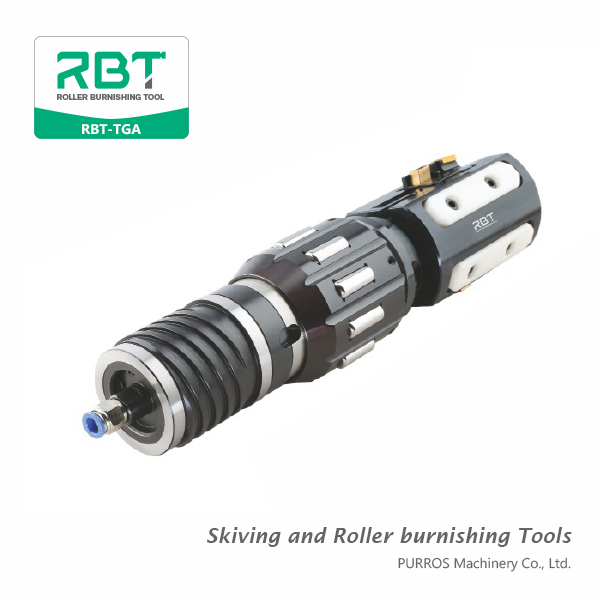 We are a manufacturer of roller burnishing tools. 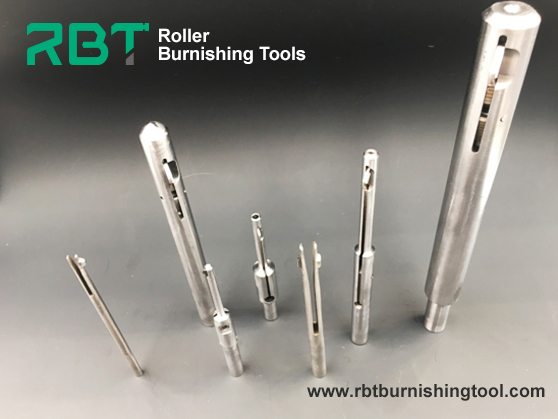 If you need custom roller burnishing tools, you can send drawings of processed parts to consult us. 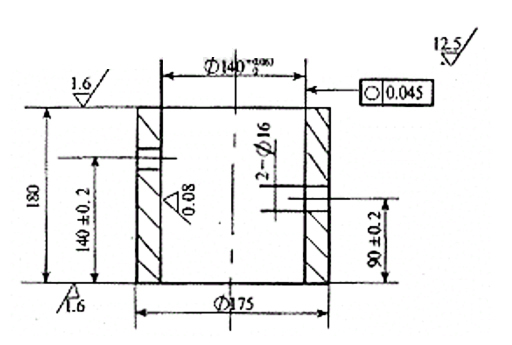 The requirement of inner hole grinding is not high, which can reach higher precision than rolling machining. In the actual production, it is difficult to reduce the temperature of the grinding area in the process of inner hole grinding, and the residual tensile stress, grinding cracks and burns will be generated in the processing of surface layer, which will affect the service performance of parts and lead to low production efficiency. Rolling burnishing has high requirements for the previous process and cannot improve the shape accuracy of parts. Because there is no heating in the processing process, it is easy to control the residual compressive stress and cold hardening in the surface layer of parts processing, which is conducive to improve the service performance of parts and high production efficiency.